Today on December 11th, 2017, Kudo Haruka performed on her final stage as a member of Morning Musume '17. Now, after five years of being a Morning Musume member, and a further year as a Hello! Pro Egg, this Idol has spread her wings, and will move on to a brand new future in acting. It's so weird to think that Duu has left Morning Musume and Hello! Project. It almost feels unreal, at this moment in time. How can she have graduated so soon? In the past five or so years, I have enjoyed everything Duu has thrown at me. Though my allegiance with Morning Musume has wavered and been stretched thin countless times, I was always able to rely on Idols like Duu to entertain me. Throughout her career as an Idol, she seemed genuine and fun, showing various sides to herself that were entertaining. Not only did she come across as a talented Idol, but she also seemed like a quirky, cute girl who had so much enthusiasm within her, and an unforgettable drive to be noticed. Thankfully a lot of other people noticed this about Duu, and not only in Japan. Since debuting as an Egg in 2010, Kudo Haruka has won over fans with her smile, charm and charisma, showcasing her talent and wowing us with her strengths. For a while now she has captivated us, allowing us to truly adore the power of Duu the Idol. Now, we will all watch as she conquers a brand new stage, drawing the attention of a new audience as she takes on acting, and charms us all once again with her talent, charisma and spirit. This is a path I look forward to seeing her thrive on. This wonderful Idol has given us so much of her life in these past five years, and we have been lucky to watch her grow from a cute young girl into a beautiful, talented young adult who has the whole world at her feet. Though she debuted as a girl who wanted to seem cool instead of chute, there is a girlish side to Kudo that truly shined during the final concert that was dedicated to her. 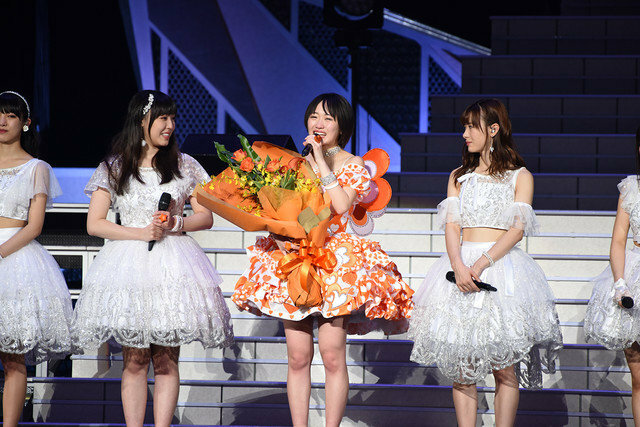 I'm sure a lot of us anticipated something cool for her to wear when she came out to give her final graduation message, but what came instead was something adorable and pretty, a side to Duu that is hardly promoted. It seems that with the end of her era in Morning Musume, so comes the end of 'Ikemen Duu'. Finally, we have seen a wonderful, cute side to the girl who once lamented at debuting with such a cutesy song. I have yet to see the full concert for Kudo Haruka's graduation concert, but from what I have seen of the last few songs, I know it's going to be a concert filled with love, emotion and energy. It's a concert that will encompass so much of Duu, and showcase her talent as a singer and a performer. Already I know her final songs as a member of Morning Musume '17, and the most surprising was the return of Pyoko Pyoko Ultra. But this was Duu's beginning, and to see her perform it again as one of the lead vocalists, and also as the young woman she is now, is an amazing sight to see. And, despite the songs happiness and silly choreography, it was an emotional moment knowing that this would be the final performance where all of the 10th generation members could perform their debut song together. I know that Duu gave her final performance her all, and that every moment was filled with gratitude towards the other members, the staff and her fans. This was a stage that she put 110% into, and I'm sure that she cherished every moment of it, and her fans in return cherished every last moment with her. Thank you for the hard work you have provided these past 6 years, and thank you for becoming an Idol that could inspire people and bring happiness into their lives. Hopefully we will see you soon, precious Duu.